What is a CVV2 security code? The Card Verification Value 2 (CVV2) security code, is part of a verification process developed by many credit card companies to reduce unauthorized use. It requires a card holder to enter the security code at checkout to verify that the card is on hand. Where is my credit card's security code located? 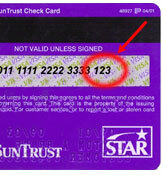 The security code is the three-digit code on the back of the card following your credit card number.